Fig.s 1-. American Numismatic Association (ANA) Logo identifying Lupia as a member. He is also a member of the American Numismatic Society (ANS), U. S. Philatelic Classics Society. Fig. 2 Photo taken in 1976, Immaculate Conception Seminary, Darlington, Mahwah, New Jersey. Fig. 3. 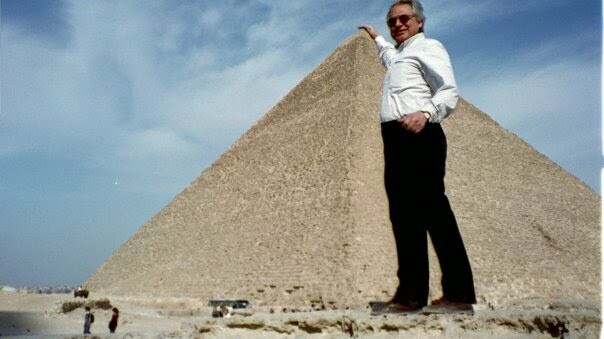 Lupia in Giza, Egypt, measuring the pyramids in 2009. Fig. 4. 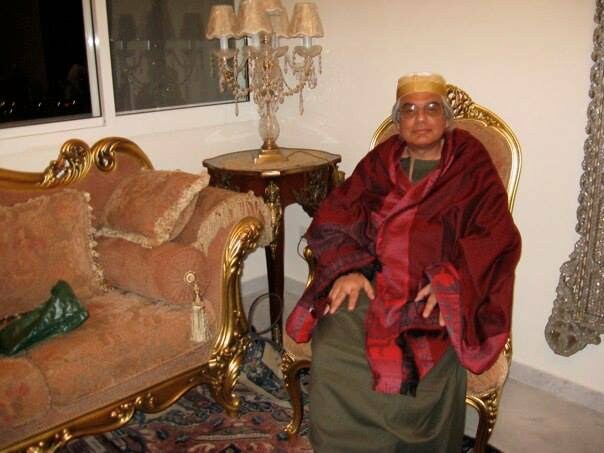 At home in Lebanon c. 2010. The Lupia family "Nobiles et Egregii Viri" have lived in the Kingdom of the Two Sicilies (Regno delle Due Sicilie) throughout its history and before that Kingdom when it was simply Calabria at Cosenza and through the province at Parenti, Cerva, Scigliano, Rogliano, Grimaldi (allied to the Princes of Monaco), Catanzaro and so forth since the 13th century (originating from the medieval kingdom of Aragon "Regnum Aragonum", in northeast Spain and were affiliated at the court of Andorra) -- where many continue to the present and throughout Italy and Europe and the Americas. The paterfamilias is our heroic ancestor Marco Antonio Lupia, Lord of Carfizzi and San Remigio, and his son Giulio, who were granted special title by the King of Aragon, Spain, ruler of the Two Sicilies. In 1498, his later heirs Marco Antonio Lupia were granted familiarity with the King of Naples and Sicily, Frederico II of Aragon at Naples (Frederick IV of Naples 1452-1504). In 1536, Girolamo and Luca Giovanni Lupia were decorated at Scigliano. 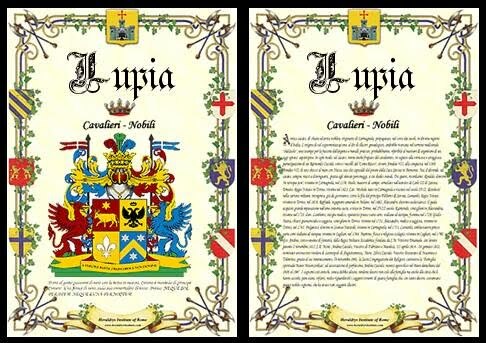 In 1708, the Emperor granted the Lupia family the royal dignitary title of Baron, and were recorded in Libro d'Oro della nobilita italiana, and in the Elenco Ufficiale Italiano, with the title Patrician of Cosenza. On September 10, 1747, Giacomo Lupia is cited in a document regarding "avvenimento miracoloso" a miraculous event. 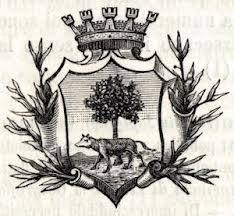 In 1793, the King granted our family a royal fief of Scalzati o Ponticelli, Calabria, and granted royal privileges in 1796, attaching the Lupia family to the aristocracy of Cosenza. Filippo Lupia from Sersale was the last Father Guardian of the Monastery at Petilia Policastro. John N. Lupia, III, the numismatist like Emmanuel Joseph Attinelli comes from nobility from the same "Kingdom of the Two Sicilies". Both men have worked on creating the comprehensive list of all numismatic auctions held in America to 1875. You could say "It took two Sicilians". The Lupia name is ancient and goes back to the origins of Rome with the Lupa Capitolina. 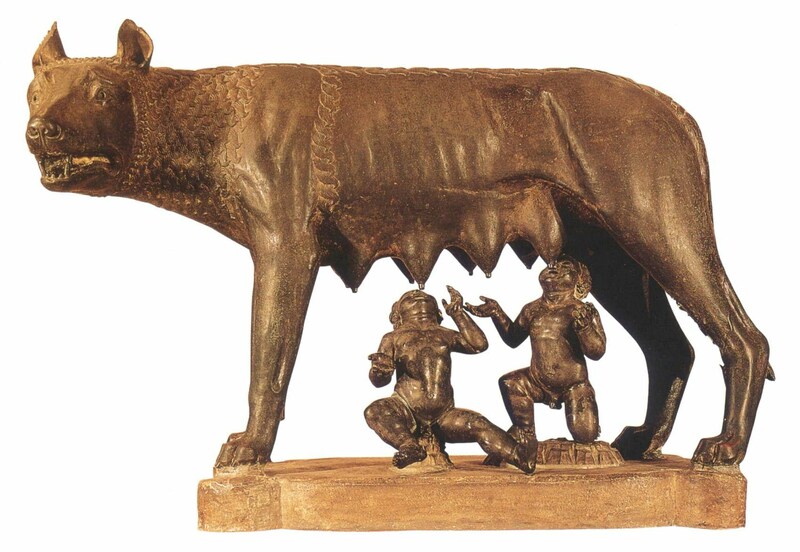 Lupia (the she-wolf) is the symbol of the maternity and birth of Rome. (Musei Capitolini, Roma, Italia) The ancient city of Lecce, Italy was named Lupia during the Roman Republic and Imperial periods. Flumen Lupia (Lupia River), flows west through the Ruhr Valley, North Rhine-Westphalia, now called the Lippe River. Fig. 11. Photo September 1969. 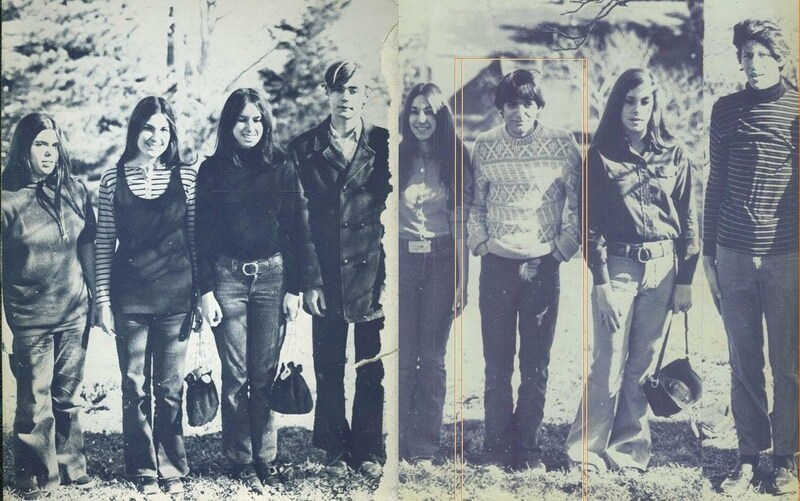 John N. Lupia, III is outlined in the orange frame in the above photo. The Lupia family in America have largely been architects and builders as his grandfather Pietro Giovanni Lupia began the Lupia Building Company in 1919 in New Jersey, and cousin Harry Lupia, a principal and founder of Engineers Incorporated ( the EI Group) also in New Jersey. However, we also have some family that aspired to military careers including Eugene Anthony Lupia, Major General, U.S.A.F. John N. Lupia was raised and groomed to be a builder but chose an ecclesiastical career in the Roman Catholic priesthood following Vatican II. Changing career he also became an expert in real estate and real property appraising as well as appraising antiques, art, antiquities, furniture, and various articles of collectible value. He was the principal of a firm that earned over $1.3 million annually and was interviewed by Deloitte & Touche, as well as Dun & Bradstreet and was given excellent ratings. John N. Lupia began visiting American museums and historical sites, especially Colonial sites like Somers Mansion, Thomas Clarke House, Liberty Hall Museum, Bainbridge House, Boxwood Hall, Allaire State Park, Rockingham State Historic Site, Smithville Mansion, Wick Farm House, General Washington's Headquarters at the Ford Mansion, Fort Nonsense, with his family and collecting coins and stamps with his father in the late 1950's. He was bitten by the "museum, archaeology and antiquities bug" from his earliest memories. His great-grandmother Nicolina Perna Marucci was a close friend of Mina Edison, the wife of Thomas Edison. Mr. Lupia spent his youth visiting the Museum and laboratory of Thomas Edison almost daily. At the age of 12 he won two art awards and a full scholarship. His artworks are found throughout the United States and around the world. Fig. 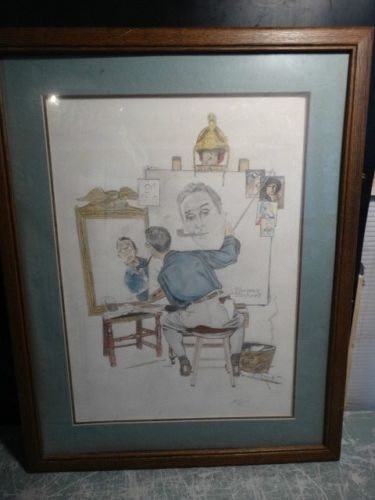 12 An example of Lupia's artwork shown here is a handmade copy of Norman Rockwell's self-portrait. Fig. 13. 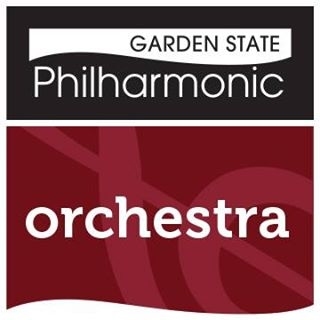 The Garden State Philharmonic Logo. He is also a professionally trained vocalist and sings tenor with the Garden State Philharmonic Masterworks Chorus, Ocean County College Choir, the Presbyterian Hospice Chorus (now the Charles Read memorial Choir), St. Joseph Choir, Trenton Diocese Choir. Fig. 13. 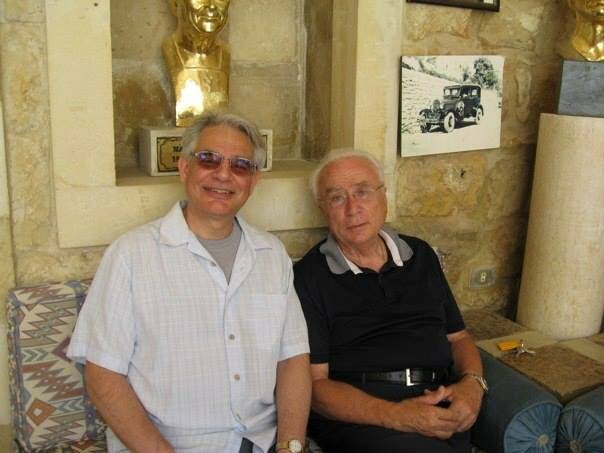 John N. Lupia, III with Samir Emile Baz, Museum of Marie Baz, Deir al-Qamar, Lebanon, 2013. Later he was trained in theology and philosophy with the Franciscan Friars Commissariat of the Holy Land who sent him to study at Duns Scotus College, Southfield, Michigan. There he studied under Fr. Rufus "Roy" Effler, O.F.M., the preeminent logician, philosopher and scholar on Duns Scotus. He then studied biblical studies and archaeology at Seton Hall University's Divinity School, (B. A. 1976). At Seton Hall University he studied with Petra ten Doesschate Chu, the preeminent scholar on Gustave Courbet; and with Louis de Foix de Crenescol, a nobleman of Andorra (our families were undoubtedly affiliated in medieval times), and preeminent expert on Michelangelo. His graduate studies in biblical scholarship were at the Immaculate Conception Seminary. He studied under Msgr. James C. Turro, one of the contributors to the Jerome Biblical Commentary. He went on to graduate studies in art history and archaeology at City College of the City University of New York, (M. A. 1982) and published his thesis An Analysis of Leonardo da Vinci's Portrait of Ginevra de' Benci, which demonstrated the portrait was rendered using anamorphic perspective. At City College he studied with Jacob Rothenberg the preeminent scholar on the Elgin Marbles, and with Irving Kaufman in the Museology degree program allowing him to work as an extern in several of the world class museums in New York City. He served as an extern in the Metropolitan Museum of Art, the Frick Museum, and the Jewish Museum, the Gugenheim, the Whitney Museum of American Art and others. He went on for his Ph. 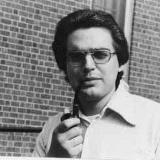 D. in art history at Rutgers University, studying under James H. Stubblebine, the preeminent Italo-Byzantine scholar of dugento and trecento art and Duccio di Buoninsegna, and early Italo-Byzantine Crucifix paintings, who was a student of Richard Offner. He served as his graduate research assistant for several articles and his book Assisi and the Rise of the Vernacular (New York : Harper & Row, 1985). He also studied Renaissance and Baroque Architectural history under Tod Marder, a student of Rudolf Wittkower. While at Rutgers he participated in the Rutgers-Princeton Student Exchange Program and studied with John Kinder Gowran Shearman, the preeminent Italian Renaissance scholar and worked with Kurt Weitzmann, the preeminent Byzantine and iconography expert. Later, he was made a graduate fellow of Rutgers School of Communications, Information and Library Studies (MLS 1993) specialist in Library Management. There he studied under Tefko Saracevic, the preeminent information scientist and Nicholas J. Belkin, the preeminent scholar on human-information-seeking-behavior, and James Anderson, Dean of the School of Information and Library Studies (SCILS) and also served as the Dean of the International Standards Organization (ISO). In 1994 he published a landmark article on Italian Renaissance artists and their use of anamorphic perspective in, "The Secret Revealed: How to Look at Italian Renaissance Painting,". Medieval and Renaissance Times, Vol. 1, no. 2 (Summer, 1994): 6–17. ISSN 1075-2110. He served as an intern at Princeton University's Special Collections in the Marquand Art Library. He taught art history and archaeology for over fifteen years at various universities including Seton Hall University and Kean University. He served as a leading contributor for Macmillan Publishers New Groves The Dictionary of Art, 34 volumes, 1996. Mr. Lupia is listed in Catholic Biblical Associations Member Directory; Gale Publishers, The Directory of American Scholars; 5 volumes, 1998 edition; ABI's International Directory of Distinguished Leadership, 10th ed; and IBC's Directory. He has been a member of the Society of Biblical Literature; American Historical Association; American Meteor Society; College Arts Association of America; the Catholic Biblical Association of America; the American Society of Papyrologists; the Society of Early Americanists; the American Numismatic Association (#1139579), the American Numismatic Society; the Numismatic Bibliomania Society; the Society of Paper Money Collectors; Medal Collectors of America, the Colonial Coin Collectors Club; the American Philatelic Society (APS# 220936), Life Member APS Library; U. S. Philatelic Classics Society (USPCS #6014), the New Jersey Postal History Society, and the United Postal Stationery Society. His studies in Modern Art were coupled with that of filmography and the history of cinema. He is a charter member of the Turner Classic Movies Backlot - TCM Backlot member No. 32244005859. In October 2002, his discovery made international news being the first antiquities expert to demonstrate that the so-called James Ossuary inscription was a fake. Seven years later, 2009, he published a book examining the Shroud of Turin as an archaeological textile and through scientific method is able to demonstrate the Shroud is an authentic ancient type of tallith worn by Jewish men from ancient times up to the time of the First Jewish Revolt when the garment design began to become modified. Through the years various modifications prevailed until the garment became reduced to what is now known as a prayer shawl. Pope Benedict XVI read the book and as a result he became the first Pope in history to declare the Shroud is a relic of Jesus Christ. In 2009, he contributed suggestions to Q. David Bowers for his outstanding landmark book on Colonial Numismatics, Whitman Encyclopedia of Colonial and Early American Coins(Atlanta, Georgia : Whitman Publishing, 2009). In 2011, he founded Numismatic Mall, a website devoted to numismatic research. For many years he has undertaken numismatic research discovering over 700 American coin auctions that were not known to contemporary American numismatic historians, and has created thousands of biographies of numismatic personalities in his Encyclopedic Dictionary of Numismatic Biographies, which he intends to publish. Meanwhile he publishes routinely at least once a week a new biography, mostly drawn from the Lupia Numismatic Library, Special Collection, The Chapman Family Correspondence Archive, which comprises 27,000 pieces of correspondence from virtually everyone of numismatic significance and those who would never be known if it weren't for his salvaging the archive to the best of his ability. Since the late 1990's Lupia has singlehandedly managed to hunt down and purchase this monumental collection comprising 27,000 pieces of correspondence. The fate of this archive now rests on the shoulders of the numismatic community to do the right thing and purchase it for the appropriate numismatic institution or else most shall be lost to numismatic history through various philatelic auctions. History is the power that determines how we shall be remembered. Only time will tell who the real heroic giant in numismatics really is. The Chapman archive is not exclusive to his pursuits for original material. He also has assembled over 1,500 pieces of original correspondence of Hiram Edmund Deats, the illustrious antiquarian, genealogist, coin, and stamp expert. Lupia's love for books is evident in his vast library of over 50,000 volumes that includes books from ancient times to contemporary scholarship. Some of his library is being sold and offered to the public on this website. In 2013 he published a groundbreaking study on the history of American numismatic auctions : American Numismatic Auctions To 1875. Volume 1. New. The complete revision of Emmanuel Joseph Attinelli's Numisgraphics privately printed in 1876. This is Volume 1 of a 2 Volume set that covers the historical sketch of American numismatic auctions beginning in 1738 and covers up to 1850. The second volume has proven to be unwieldily in size and the delay in publishing caused finding the right publisher to print the book with a sturdy saddle-stitching and good cloth or leather binding. He has published numerous articles in various journals on history, art history, papyri, the New Testament, Biblical archaeology, American numismatics, and philatelics. For the past few years he has published a weekly column in E-Sylum, the online weekly digital version of the quarterly Asylum, the house organ of the Numismatic Bibliomania Society. Professor Lupia works as a Museum Docent, Ocean County Historical Society. A candidate and student of the Secular Carmelites.